In the troubled world where we all live now, Wonder is a gift of two hours to think about basic human decency. If you are even for a moment tempted to label it as too sentimental, you would miss a grand two hours. Stephen Chbosky has written and directed a story that might have been just that in lesser hands, but the cast that delivers his story is so good that it becomes an invitation to sink in and appreciate the message. Auggie (Jacob Tremblay) is a ten year old boy with facial scars that are the result of surgeries aimed at repairing birth defects. Against all odds, he is alive, well, and very smart, but he has been home schooled by his mother Isabel (Julia Roberts) who wanted to protect him from any possible ridicule. He hides his face full time in an astronaut suit with a helmet that hides his scars. As the movie opens, Auggie is going to school for the first time. On that first day, he inevitably suffers the stares of his classmates. From that point forward, we get alternating glimpses of Auggie’s life at school and his life at home. We learn that his parents have built their lives around their love and support for him while ignoring the emotional needs of his lovely older sister Via. But when he sees the stares of his classmates, he crumbles. Under the wise encouragement of school headmaster, Mr. Tushman (Mandy Patinkin), Auggie wends his way through rebuffs and hurt along with the beginnings of humor and acceptance. The politics of the sixth grade are sometimes subtle, sometimes obvious, and often hurtful. The whole is done so well that we find ourselves deep in the story wondering how we ourselves could have done it, how we could have taught an entire sixth grade to celebrate acceptance of this smart, funny classmate whose face is the initial announcement of who he is. This movie that might have been mawkish becomes genuinely moving for one reason: the cast. 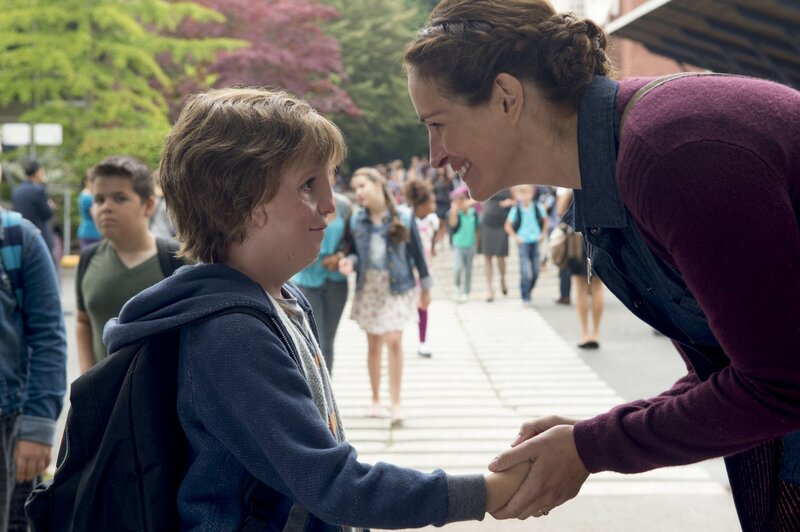 Without even a hint of overacting, Julia Roberts creates a mother attuned to her son’s childhood needs and to the moment when he must step into the real world. Isabela Vidovic creates Auggie’s older sister who is loved but often ignored by her parents because she is both pretty and smart and will make it on her own. Vidovic’s performance in nuanced and beautiful, and she is matched perfectly by Nadji Jeter who becomes her boyfriend with great appeal of his own. Owen Wilson is okay as Dad, but seems an oddly alien presence in his own family. Don’t waste a minute resenting the sentimentality. When a cast like this reminds us of the rewards of abandoning judgement, we realize how widely this is needed in so many areas of life today. Is it possible to bring open minds to issues instead of the partisan entrenchment we see in both the sixth grade and in our world? Hail, Auggie. This review was posted on December 9, 2017, in Drama, Family-Kids. Bookmark the permalink.